After two months of engagement with college bound students, Dorm Room Movers is pleased to announce their contest winner. Dorm Room Movers made the process of moving into college smoother and more convenient then ever before. Dorm Room Movers, a leading moving, shipping and storage service provider for college students announced their summer Ship To College contest winner Geza Frey on September 20th. The contest prizes included a pair of Dr Dre Beats headphones as well as a box of 35 essential dorm room items courtesy of DormCo. 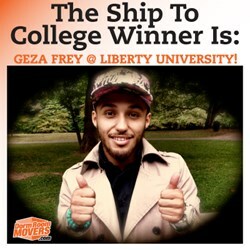 Geza, a junior at Liberty University was pleased to be the reciprocate of the winnings stated that "Dorm Room Movers made the process of moving into college smoother and more convenient then ever before. Being an out of state student it is difficult to transport my things in a stress free manner, but the convenience and affordability of Dorm Room Movers has changed the way I view move in day." Dorm Room Movers' Ship to College service allows students to ship their items to college for a low cost that includes boxes, tape and at valet schools in-room delivery. With over six years of experience in moving, shipping and storing student’s stuff, Dorm Room Movers prides itself on providing a full service solutions for the collegiate community. For more information concerning Dorm Room Movers please contact Miki Noble at 480-800-4920 or miki(at)dormroommovers(dot)com. For more information concerning Dorm Room Movers services, please visit DormRoomMovers.com. Dorm Room Movers was founded in 2007, and since has helped thousands of students move, store and ship their belongings. Dorm Room Movers offers full service summer storage, shipping to and from college and local moving services. Their shipping services are available nationwide and moving & storage services is available at over 100 campuses this year.